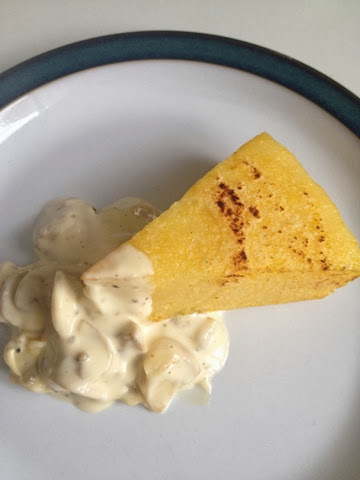 There is no grain that polarises opinion more than polenta. Most people I know can't stand it. Even an Eastern European friend, who should be guzzling this stuff, couldn't understand why I would order polenta fingers at a restaurant. It's peasant food, he said. But peasant food or not, I like the simple comfort of polenta. I like it even better when it is cut into fingers or wedges, then pan fried. And topped, in this case, with a creamy mushroom sauce. I am not going to tell you how to cook polenta because it varies from one package to the other. So go by what it says on yours. Once it's cooked through, pour into a greased pan large enough to hold about 1 inch thick layer. The one you see above is in fact a bit too thick. Once it's in the pan, leave it in the fridge overnight to set. Next day, cut into fingers or wedges or a shape of your choice. Heat a tbsp of olive oil in a pan and shallow fry your polenta until browned on both sides. The thinner you set it, the crisper it will be. I like polenta best with this creamy mushroom sauce that's also super easy. Wash 4-5 mushroom. Remove stems, pat dry and cut into thin slices. Peel and finely mince a clove of garlic. In a small pan, melt a tsp of butter. Add garlic and sauté until it starts to brown. Then add mushrooms and stir fry on a high heat until they are browned and cooked through. Now add 2 tbsp cream, cook for just another minute to heat it through and finish with a pinch of salt and a dash of fresh ground pepper.